Hey I wanted to show you this photo of mine called Apple. Early one morning as I was getting ready for a class back when I was going to MCC. I was eating an apple and started staring at the other apples sitting on the counter as I gazed out the back door. It was a cold winter day snow fell though out the night. Nice fresh snow on the ground. So I went though the apples to find a nice unbruised apple to use. 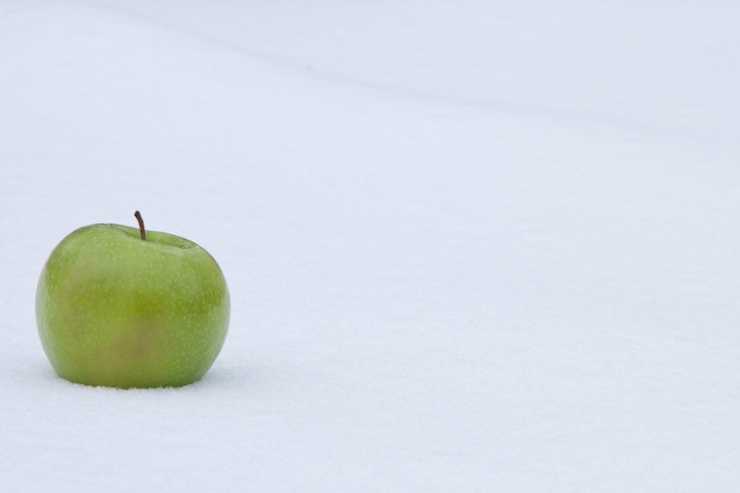 Now I had to look for a spot for this apple to photograph against the snow. All this with out disturbing the snow. I was all over the yard trying out different spots doing my best to keep distractions out of the background of the image. So here is what I came up with. There is another image from this same shoot that I like as well. It is a view from above. Well maybe I will show that one some other time. Sometimes my mind just wonders around and if I can I will try my best to capture the image. Feel free to write back a comment on how or what you think about the image. It is always great to hear back from you. Sometimes a image can stir up a persons memories or imagination. I might have one thing in mind as I shoot, but it is all the different thoughts that a image can stir up that gives a photo power.